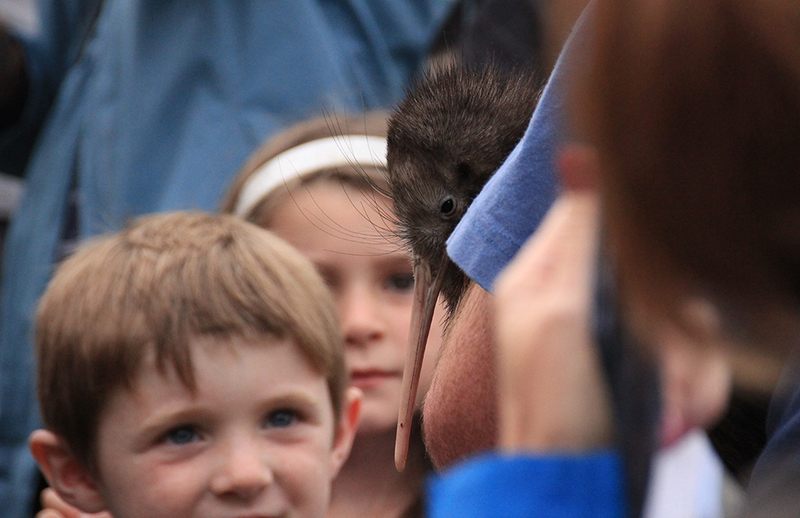 If I was to recommend one New Zealand location for kiwi watching it would be the region around Whangarei in Northland. Already a few years ago, I was lucky enough to meet Sparky here. In March 2018, I made acquaintance with Ross and 3 of his friends. 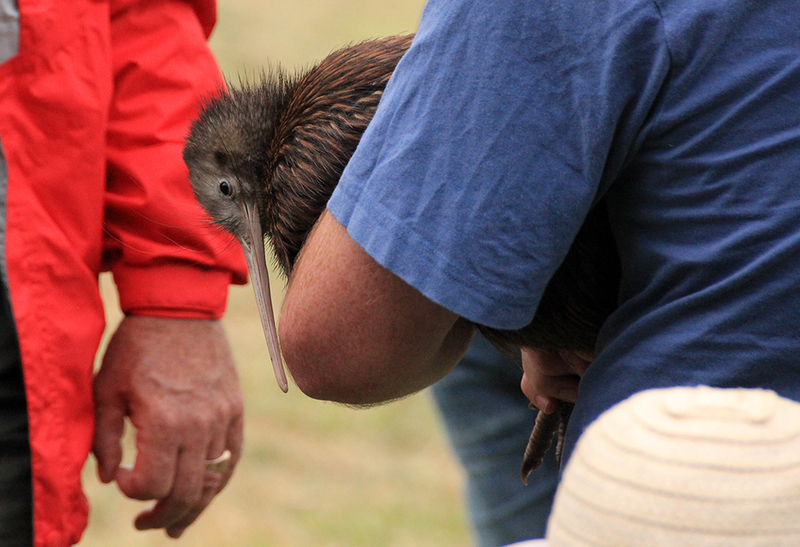 The 4 kiwi birds have been released into the wild at Parua Bay (Whangarei Heads), after settling over from the stoat free Limestone Island. 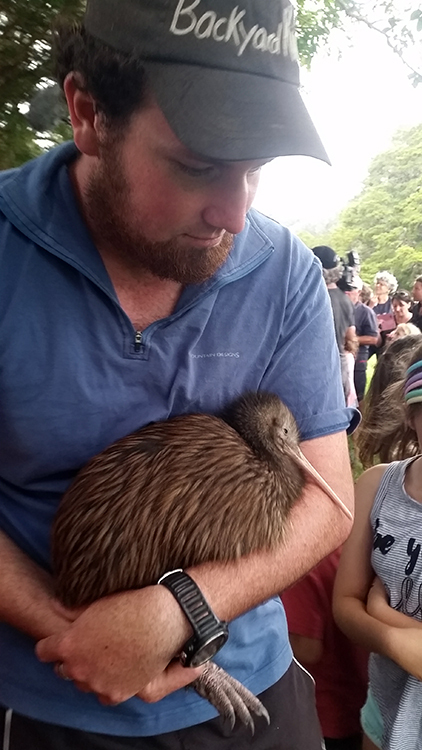 Since more than 15 years, Backyard Kiwi (WHLF) is monitoring wild kiwi in the area and capturing chicks shortly after they have been hatching. The birds then get transported to the predator free Limestone Island off the Whangarei Heads coast where they can grow and get strong enough to stand a chance of survival against all kinds of mammals populating New Zealand’s mainland. 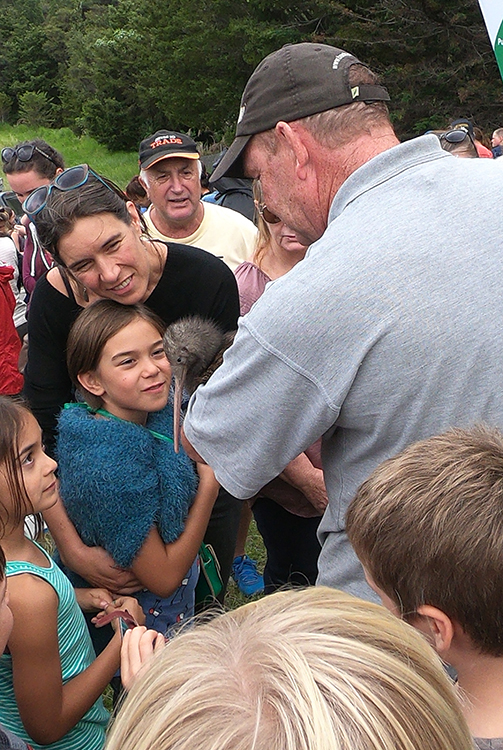 Once strong enough (after 6 months or more), the kiwi are recaptured and brought back to Whangarei Heads to introduce wider genetic variety into the area. This might sound like a lenghty procedure, which still does not guarantee the kiwi’s survival once it’s back on the mainland. 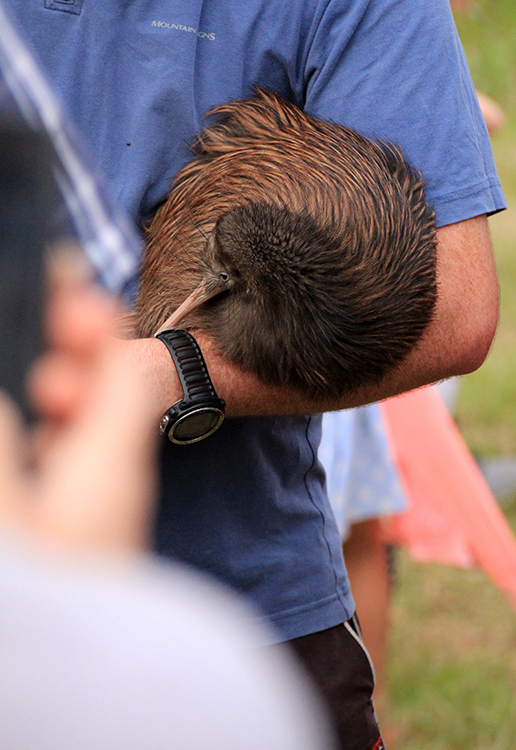 Still, the success rate speaks for itself: from previously 80 kiwi birds in the region (2001), the number went up to 800+ kiwi (2018). Their movements are tracked and regularly updated in this map, proving that the Whangarei Heads community can truly claim to have kiwi in their backyard. 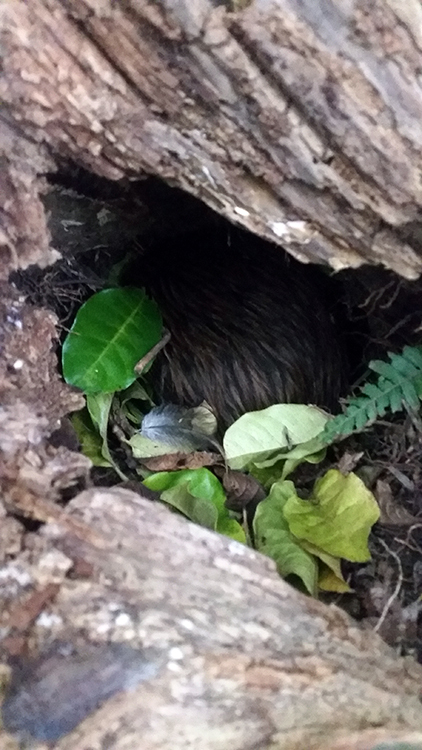 Backyard Kiwi is organizing regular kiwi releases. If you would like to use the occasion to meet these nocturnal birds up close, keep an eye on their website or Facebook page, where they announce their release dates ahead of time. What a star. Photo. Click. Photo. Click. Home sweet home! This is where the kiwi got released. After catching up some sleep it probably went out to search for food. 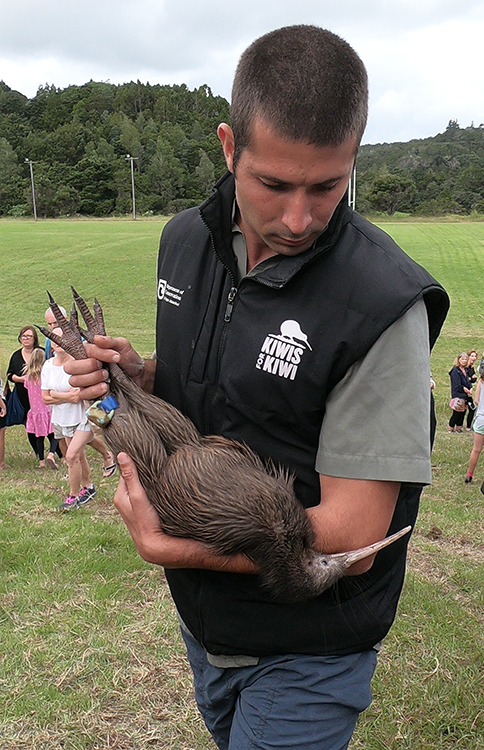 The kiwi birds can move around freely and aren’t forced to stay at their release place. Some of them have been tracked over a distance of 10 kilometres. 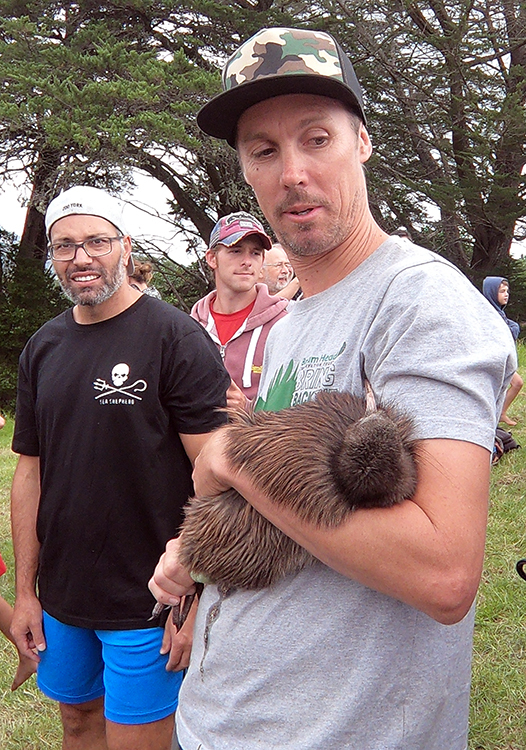 Here is a short bonus video from the moment when the kiwi got placed into his new home in Parua Bay. Good luck little fellow! Canon EOS 60D, 31mm, ISO 1000, F9, 1/640 sec. Location: Lake Rotopounamu, Tongariro NP, New Zealand. Thanks to one of my Kiwi tweeps (@nickwallen, a savvy Kiwi Marketing Manager) I recently discovered the New Zealand Story, a video “that defines the distinctly Kiwi attributes that make us [New Zealanders] unique”. To be precise, the story defines these three attributes as “typical lil ol’ EnZed”: Open spaces, open hearts and open minds. After living in New Zealand for 3.5 years I wholeheartedly agree with its content, though the video doesn’t tell the whole story. How could it, in 3:45 minutes? Don’t get me wrong — it’s a great story, but it’s a flawless one as well. It’s TOO perfect. It lacks a little twist; or did you ever lose your heart to a perfect protagonist? I didn’t! Open spaces, yes. Open hearts, yes. Open minds, yes. Open windows, no. Want to get your windows cleaned from the outside? 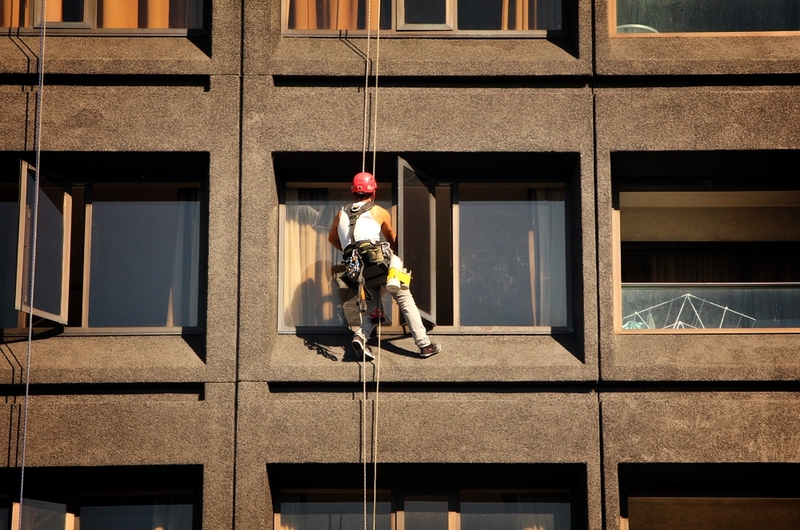 Professional window cleaners practicing high rise abseiling once a year is a thing in NZ. Sinks without mixing taps. You got the choice between blisters, cold shock, or major bathroom flooding. Yay! No mobile network in suburbs. Our friends living 30 km outside Auckland CBD cannot be reached after 6 pm. FYI: “Suburbs” in New Zealand can be whole cities, even complete stretches of a coast line. Mountain names. Too long (Taumata­whakatangihanga­koauau­o­tamatea­turi­pukakapiki­maunga­horo­nuku­pokai­whenua­kitanatahu), too scary (Mount Hopeless, Mount Misery, Mount Horrible, Mount Dreadful, Mount Bitterness), too… words fail me (Pudding Hill, Drunken Sailors Hill). Talking about creative Kiwi names, please allow me to elaborate on bank names (ANZ, BNZ), restaurant names (Saigon, Tokyo, Brazil), hair dresser names (Newton Barbershop, Eden Barbershop, Roskill Barbershop), dry cleaner names (Symonds Street Dry Cleaner, Queen Street Dry Cleaner, Papanui Road Dry Cleaner)… you get the idea. ALL towns in NZ are worth a visit. I ticked off the shearing capital, the salmon capital, the kiwi capital (not Wellington! 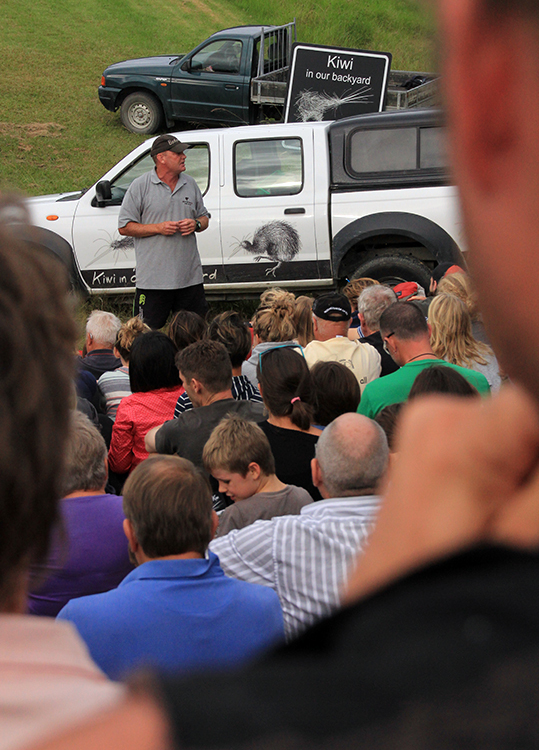 ), the gumboot capital, the doughnut capital… all equipped with life size statues of “whatever they’re famous for”. Why would you not consider a holiday photo with a 4 meter tall salmon as a must have? A self-declared Republic in the Republic. 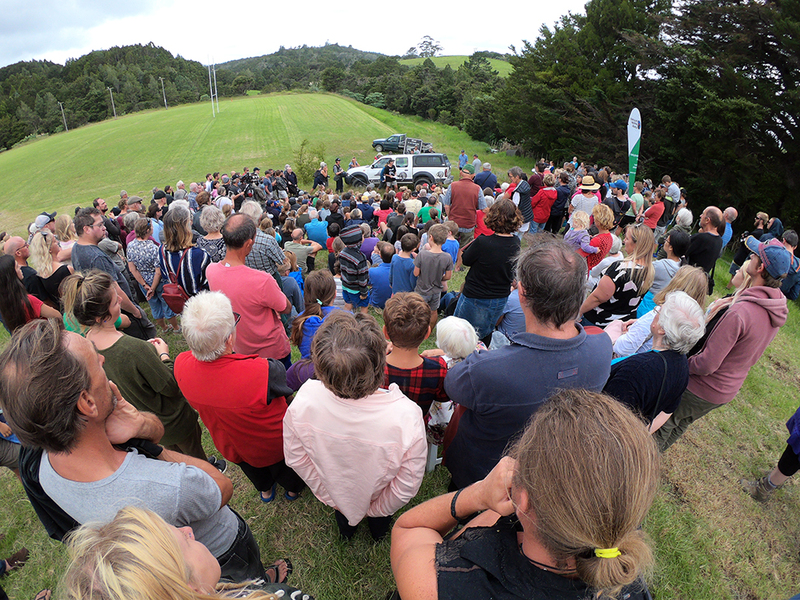 The small township of Whangamomona on the Forgotten World Highway declared their own Republic as protest reaction to being moved to a different regional council. They have their own President (currently Murt “Murtle the Turtle” Kennard). No kidding! 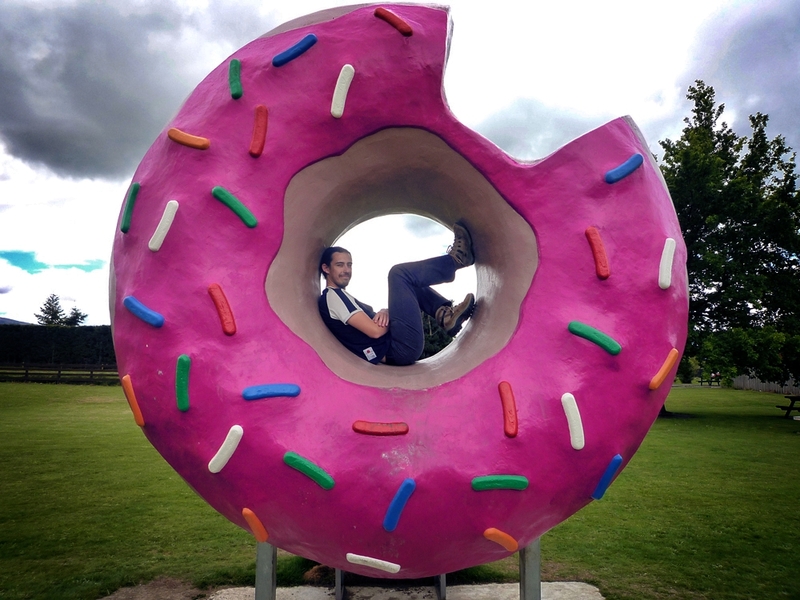 Doughnut capital in New Zealand — Springfield, what else?! Fried pizza. Fried ice cream. Vegemite (yeast extract spread from Australia) = yikes; Marmite (yeast extract spread from New Zealand) = yummi. (Coffee) refill packs are more expensive than new (coffee) tins. Bavarian hotdogs with Sauerkraut and milk roll (allow me one comment anyway: I’m German, you fools!). Schwarzwälder Kirsch with strawberries (#OMG). Typical food prices: .98 NZD or .99 NZD. But of course they have no 1 or 2 cent coins. If not paying by card, the cash price is rounded up or down accordingly. 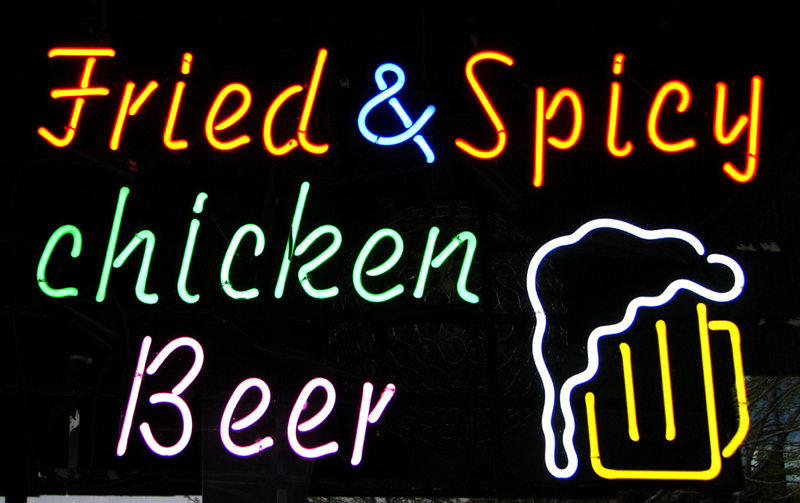 Kiwis love their food (drinks?) deep fried! A passion for meaningless security checks. Not sure I can generalize that point, but it happened to me, so it got to be on my list. Embracing exaggerated journalism: “White Out – The Historic Snowfalls of 2011” — happened each time the national news had nothing else to talk about. Down to earth people. I once asked on Twitter for Auckland cafes doing the best Latte Art. Gred Boyed, the host of TV NZ’s daily evening news tweeted me his personal recommendation. In France, I’m still waiting for Mélissa Theuriau to even join Twitter. 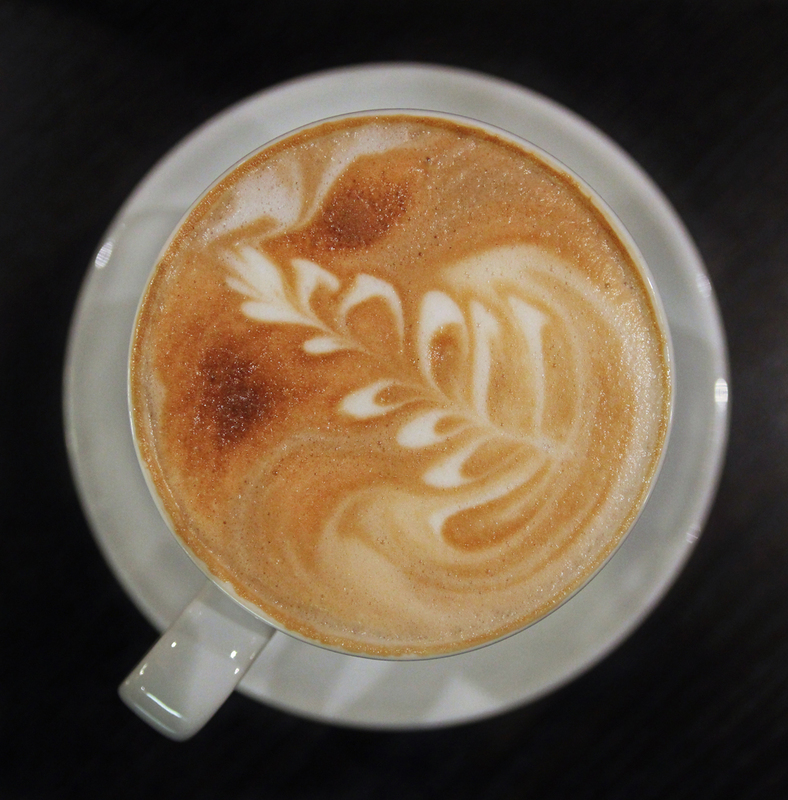 Typical latte art: New Zealand fern! Aggressive driving behaviour is the one point on this list which actually doesn’t make NZ more likeable. I have been constrained, pushed, honked and yelled at — both as driver as well as pedestrian. Sticking to their national limit of 100km/h is not an easy task for many kiwis, especially the guys investing a ridiculous amount of money into a Porsche or Ferrari just for being told they can’t race with it. Consequently, New Zealand is one of few countries that creatively address the problem of drinking and driving in innovative advertisements which other countries would consider taboo. They teach dogs how to drive cars. Why? Good question! Kiwis like to customize their car signs. I liked the sign of a German immigrant saying HOTOMA (hot granny). Kiwis can take themselves very serious. In 2013, NZ changed an old road rule. They advertised for months (billboards, TV, social media) that the new rule would be in effect as of April 1, 2013. In March, they decided to change their ads and put the new rule in place March 25, just because they were afraid people would think the whole rule change would be an April Fool’s joke, increasing the chance of having more accidents in April. When kiwis don’t drive, they walk or run. Barefoot. Whenever, wherever. My sympathy for that activity stops in front of the public toilet door. Theirs not. Quite a collection for someone who thought the Haka is the “most hilarious thing” about New Zealand. That’s 3.5 years ago now. Rookie mistake! Are you as excited about the latest The Hobbit trailer as I am? Five weeks from today I will sit in one of those wide and comfy cinema armchairs, glued to the screen, absorbing Peter Jackson’s latest visual tricks like a sponge, while marvelling at the Trilogy’s sceneries. Best thing about it: I have been there! Most outdoor scenes have been filmed in New Zealand, just like most scenes for The Lord of the Rings. New Zealand is officially Middle-earth; and Mt. 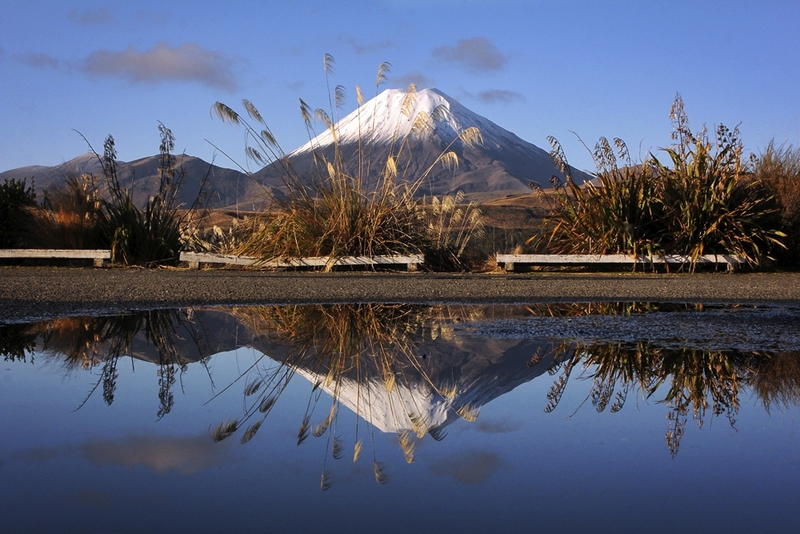 Ngauruhoe in Tongariro National Park is the most popular location among orcs fans, as they can attempt to climb “Mt. Doom” and conquer Mordor. One does not simply walk into Mordor? Oh well, I must have gotten lucky the last 6 times I visited. Yes — visited. I looked and behaved like a tourist in Mordor, and of course I captured it on film (in the form of a 16 GB memory card). On a foggy day, the region is indeed all about doom and gloom (like in the movies). But on all other days, Tongariro is one surprisingly colourful place to discover. I have been lucky enough to visit the region during all 4 seasons. Each season is unique and totally worth it. But let’s allow some photos to talk for themselves. Who else is looking forward to rediscover New Zealand in The Hobbit: The Battle of the Five Armies? In New Zealand, “From Cape Reinga to The Bluff” is a frequently used phrase to describe a trip from the country’s northernmost point to the country’s southernmost point. It’s a bit incorrect though. While Cape Reinga is the northernmost point you can reach on State Highway 1 (SH1), and Bluff is the southernmost point you can reach on SH1, both locations are, from a geographical point of view, no extreme points of New Zealand (points that lie farther north or south than any other location in the country). Therefore, I’d like to show you how the northern and southern extreme points of New Zealand’s two biggest islands look like. Please expect a few surprising differences given that the length of New Zealand — measured as a gentle curve from the northern tip of the North Island to the southern tip of the South Island — is around 1,500 km. (I’m sorry that I have to turn a blind eye on Stewart Island here; I sadly never made it there. Wrong! Never say never!). Join me on my photo series from the North Island’s northern tip — the North Cape — to the North Island’s Southern tip — Cape Palliser, before we continue on the South Island’s Northern tip — Cape Farewell — heading all the way down to the South Island’s Southern tip — Slope Point. Make sure to click on the photos for detailed captions and insights. …This is the view towards the northern tip of New Zealand’s North Island. The Surville Cliffs on the North Cape are 30 km East of Cape Reinga. While they are not very accessible, you can at least spot that northernmost point of the country from the lighthouse at Cape Reinga. Fun Fact: Here is another extreme point of New Zealand — also visible from the Cape Reinga lighthouse: The Cape Maria van Diemen is the westernmost point of the country’s North Island. And what is typical for the northernmost point of New Zealand? It is generally considered the separation marker between the Tasman Sea to the West and the Pacific Ocean to the East. Have a closer look at the photo and you will see how the two seas clash and create unsettled waters (there is a colour difference too). The Māori refer to this as the meeting of Rehua and Whitirea; being a male and a female respectively. Another cape, another lighthouse. Cape Palliser is the southernmost point on the North Island. It is actually further South than the top of the South Island (= Cape Farewell, see further below). Once you climbed the 250+ steps you reach the base of the lighthouse which was built in 1897 and is fully automated and managed from a control room in Wellington since 1986 (like all of the country’s lighthouses). …However, there is one spot nearby which attracts a crazy bunch of tourists — I’m talking about Lord of the Rings fans! Not far from Cape Palliser, you can visit the Putangirua Pinnacles, weird earth formations that served as film location in Peter Jackson’s trilogy. And there I discovered something I had never seen before: Heaps of old shells enclosed in rocks along the river bed. Old South! Let’s move on to what I consider as my personal favorite extreme point of New Zealand: Cape Farewell, a super remote spot made of quartz sandstones constantly blowing up in your face. These quartz sands derive from the erosion of granites and other rocks on the West Coast from where they are transported northward by coastal drift. At Cape Farewell, they form a 15 miles sandspit comprising shifting sand dunes up to several metres high. Tons and tons of sand and shells forming artistic patterns in the spit dunes. Love it! At Slope Point in the Catlins, eroded cliffs drop down to the wild sea below. Can you see the contrast between the S/S and N/N? Wind rules over here! The land around Slope Point is used for sheep farming with no houses anywhere nearby. Hence, you have a good view on all the trees that have been deformed by the arctic winds that often hit that spot of the country. There is no road to Slope Point; it must be reached by a 20-minute walk over a very odd looking moss carpet. Nature is an artist! Once you reached Slope Point, you’ll find a signpost showing you the distance to the Equator (5,140 km) and the South Pole (4,803 km). It’s chilly here! Have you been to one or several extreme points of New Zealand yet (N-S-E-W)? Which one is your favorite? Since the South Island’s extreme points in the West and East are hard to reach, I would be very interested to see your photos and hear your story of the West Cape in Fiordland (westernmost point) or the West Head in the Marlborough Sounds (which is, despite its name, the easternmost point). Now let me end today’s post with one of my photos from another beautiful extreme: The North Island’s easternmost point — the East Cape. This is where I have witnessed the last sunrise of the year 2012 (December 31) as one of the first persons in the world (a stone’s throw from the international date line). Now how did I get my 3 seconds of fame in the upcoming episode 5 of this TV show? Turns out my WordPress SEO efforts start bringing in results. 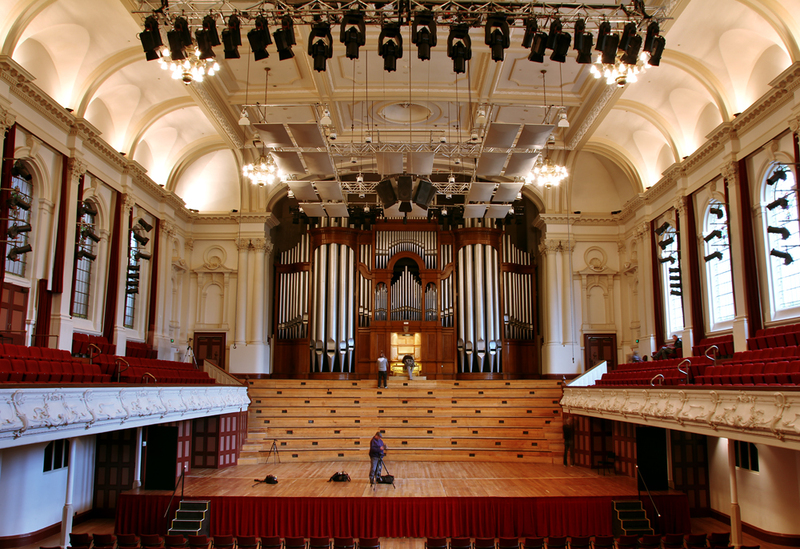 Said production company found me while doing research for image material from the Auckland town hall (must read story if you haven’t done so yet) since one part of their documentation is about the Christchurch town hall and a comparison to other town halls in the country. As luck would have it, I lived in Christchurch in 2011. I experienced the earthquakes (aftershocks) myself; I saw the devastation, got frightened and considered checking the Quake Map an essential part of my morning routine. But I also experienced the community’s kindness and readiness to help others. That said, it’s an honour for me to be (a teeny-tiny) part of that show which portrays in an excellent way how people cope with the situation each and every day ever since the first earthquake hit Christchurch 4 years ago. If you are interested, the show airs on TV ONE, Sunday 11:30am (New Zealand Time). All episodes are available on demand as well. Being in France now, I sadly can’t watch New Zealand TV on demand. I hope Canterbury Television will get the rights to upload the videos lateron on their YouTube channel, as already done with episode 1 of “Christchurch: From the Streets” which aired end of September. It’s very moving to revisit these places after such a long time!